Sidechaining is a mixing technique that allows you to have one plug-in affect the track or bus it's inserted on based upon another signal's properties. A simple example would be "ducking." A technique often used in radio broadcasts—Sometimes, there will be music playing in the background while a DJ is speaking. When the DJ is not talking the music is louder, and when he begins again, it turns back down. This is accomplished by routing the signal from the radio personality's microphone to the "Sidechain input" of a compressor. There is a second input on the device where the signal to be processed is sent, in this case the music. The output from the compressor will be the music, but at varying levels. The louder the voice from the mic is, the more the music signal is attenuated or turned down. That's a pretty practical use for sidechaining. However, the creative/musical possibilities are pretty awesome. For example: You can have a sustaining guitar chord on one track and have it "trigger" on and off based on the signal sent from your hi-hat track. Download this SONAR Bundle File and follow along as we walk through the "guitar hi-hat trigger" example mentioned above. This project contains 2 tracks—One for the hi-hat pattern and one for the guitar chord. They are minimized, so type the "F" key on your computer keyboard to optimize their height. The first step is inserting the Sonitus:fx Gate into the FX Bin on the "Guitar" track, which is the track that houses the sound that will actually be processed. When a plug-in that has a sidechain input is added to a project, that input is exposed to all of the other tracks. So, lets right-click track 2 (the hi-hat track) and choose "Insert Send." Select "Sonitus:fx Gate (Side Input)-Guitar" from the list. You will need to click the little box next to the new send to enable it (see image below). Using an aux send allows us to continue hearing the hi-hat because we're sending a copy of the signal to the Gate plug-in. As an alternative we could use the track output. However this would result in the hi-hat being inaudible (note that you may occasionally want such behavior). We now have the hi-hat signal routed to the Gate plug-in on the guitar track. We want the "Gate" to open when it hears the hi-hat, and close when it does not. You can only hear the guitar when the Gate's open. Let's take a look at the Sonitus:fx Gate settings. Double-click it in the guitar track FX bin to open it's window. The first parameter to adjust would be the "Threshold." 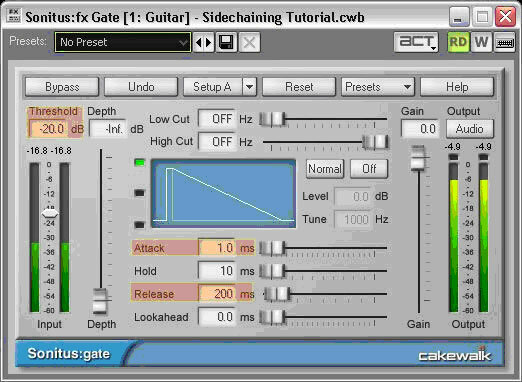 This setting specifies how loud the sidechain input needs to be for the Gate to open and how low it needs to be for it to close. Usually, you'll need to play with it a bit—but I found that -20 dB works well in this example. You should now hear the guitar "keying." We can tweak the way the Gate opens and closes. The most important settings are "Attack" and "Release." Attack controls how quickly the Gate opens, or how fast the guitar signal fades in. A higher number will cause a slower fade in. Release is the exact opposite—how long it should take for the Gate to completely close when the sidechain input signal becomes lower than the threshold. A higher number will result in a longer fade out. Try using this technique in one of your projects. Be creative—you're not limited to guitar and hi-hat...try using this method to add some beef to your kick drum. Just key in a 55Hz wave. You're also not limited to keying. You can also try ducking with a compressor (listen to the "pumping" sound in Daft Punk's One More Time). There are TONS of possibilities.